New signing Harrison Reeves is welcomed aboard by Shane Keegan. Galway United get the 2018 SSE Airtricity League First Division season underway with a home game against Athlone Town at Eamonn Deacy Park on Friday, February 23rd. Kick-off: 7.45pm. A swift return to the top flight has been targeted by United boss Shane Keegan. 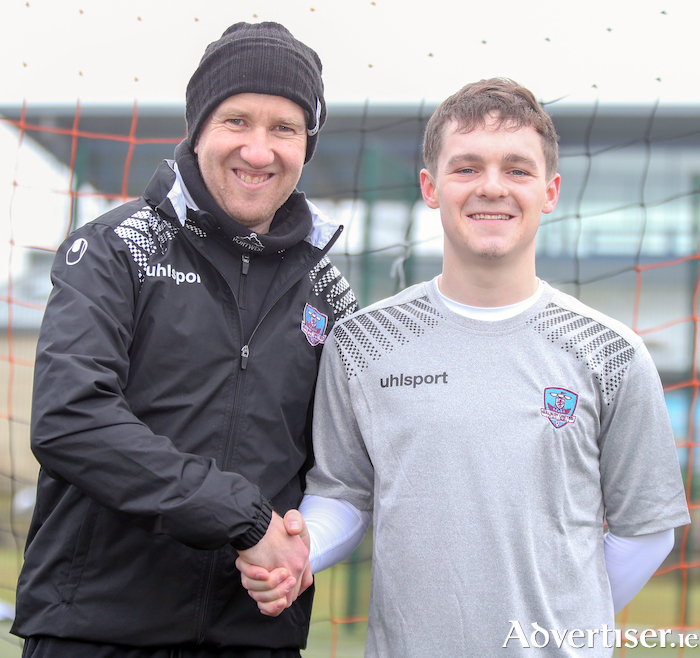 Danny Furlong, who has previously worked with Keegan at Wexford Youths, has arrived to strengthen United's front-line. Keegan has been active in off season, recruiting Furlong, Harrison ReevesTadhg Ryan, Arek Mamala, Connor Gleeson, Stephen Walsh, Robbie Williams, Stephen Kenny, Alan Murphy, Ryan Connolly, Carlton Ubaezuonu and Conor Layng after losing a number of key players. Keegan insists United must make a positive start to the season and he expects the First Division to be a tight affair with every team believing they can at least secure a Play-off berth. Shane Keegan has concluded his 2018 squad with the signing of English midfielder Harrison Reeves. The 19-year-old spent his career with Bristol City, having joined their academy's under-10 team, where he remained until turning 18 last season. After his release from Ashton Gate, Reeves gained senior experience with lower league sides Dursley Town, Brimscombe & Thrupp and Slimbridge. Reeves made an impressive cameo appearance for United in last week's 1-0 win against Shelbourne at Tolka Park. Shane Keegan saw enough in Reeves to make him his final signing on the eve of the 2018 SSE Airtricity League First Division season and the young midfielder will wear the number 22 jersey for United. Keegan spoke to www.galwayunitedfc.ie about the latest addition to his squad: "Harrison came to us late in pre-season, but he really impressed when he played against Shelbourne. "Harrison also went out and played for our under-19s the following day as well and again, did fantastically in that game too. That was what probably made us move on him. "He's really technical, has a fantastic eye for a pass and through ball, he gives us options behind the striker and also a little bit deeper in the centre of midfield as well. "He's a small guy, probably one of the smallest to grace the League of Ireland, but he's a little terrier, size means nothing to him and he's been very impressive around the place. "The fact that Harrison can play in a number of positions is a huge plus for us. He uses that low centre of gravity well, I think he will see plenty of playing time and he's a player who could potentially have a big impact for us. "Harrison has a superb attitude and that was probably the chief reason we've made him the final addition to our squad. He fits in well with the character and personality that we're trying to create within our squad." 2018 GALWAY UNITED SQUAD (23 ): Tadhg Ryan, Arek Mamala, Connor Gleeson, Gary Shanahan, Aaron Conway, Maurice Nugent, Adam Rooney, Stephen Walsh, Robbie Williams, Gary Kinneen, Marc Ludden, Stephen Kenny, Conor Melody, Conor Barry, Alan Murphy, Alex Byrne, Ryan Connolly, Harrison Reeves, Ronan Manning, Carlton Ubaezuonu, Danny Furlong, Eoin McCormack, Conor Layng. "We're just waiting for the whistle to blow now on Friday night. We've managed to assemble what looks like a really good squad. I think week by week, performance by performance, we will develop and get to the level we would hope to be at. Our quality and mental strength needs to be at the fore over the first few weeks of the season, to make sure that we get the results that we need. "We have to go out and do the business on Friday night. It sits a little uneasy with me how little I've seen of Athlone Town in pre-season. Their last two friendlies have been called off so I haven't had an opportunity to watch them. I do really like to know the opposition inside out, but that has to be shoved to one side, it's up to us to make sure that the game is played on our terms as much as possible. "We do need to hit the ground running, it's so important that we don't latch ourselves on to any excuses. We go out, we perform and we go and do the business. It has to be as simple as that." Conor Melody (knee ) is Galway United's only absentee. Shane Keegan confirmed a number of players were lacking match sharpness due to niggling injuries in pre-season, but they experienced no issues in training in the lead up to the Athlone Town game.